The Limi Valley is considered one of the most remote and remarkable valleys in the Nepal Himalaya. It is definitely a most beautiful valley if you appreciate Tibetan landscapes, dry and desert like surrounded by very high mountains. Limi is poulated by Tibetan people who speak a dialect of Tibetan. They live in 3 villages strung out in the Limi Valley floor with trail connections between them (rideable). Traditionally linked to the Tibetan areas around the lake Manasarovar and still linked to Chinese Tibet, the livelihoods are slowly changing due to changing markets and increasing confinement by the Chinese. The pastoralism and agriculture is initmately connected to trade and handicraft production (wooden bowls for the Tibetan market), meat and grain trade and transport business – that is caravaning by yaks, mules and horses. Barley and wheat are the main grains produced and eaten here, and vegetables like mustard leaf/oil, radishes , potatoes etc. In one travel log I have described the valley, and in the Kailash trail travelogue I have described how to get from Simkot to Limi. Note that Limi is a restricted area and you will need to get through a hefty amount of red tape and some ecxtra trekking fees to get there. You cannot legally go on your own, and you should not try it iether given the remoteness and objective dangers here. From Simkot there is a nice, short acclimatization hike up to Simkot Lagna (pass) at 3270 meters just to the northwest of town. 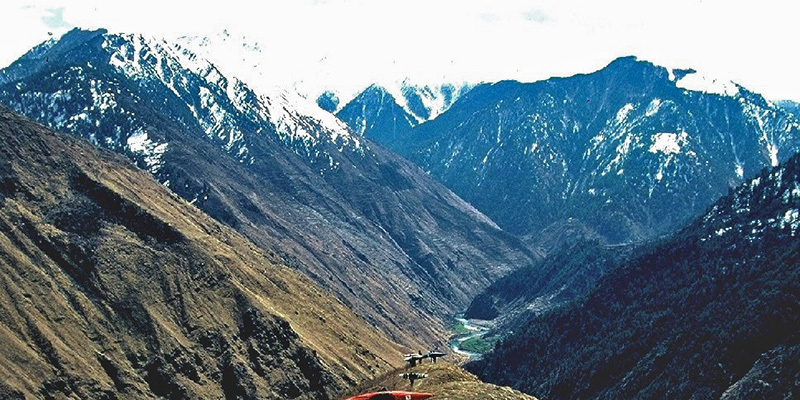 From Simkot Lagna you can catch a glimpse toward the upper parts of Humla Karnali valley and the first pass toward Limi. If the skies are clear you will also see some of the ridges toward Saipal Himal (7031 meters) and lesser peaks spurring out from it, and several high peaks toward the northeast as well. On the opposite side of the Karnali River you will see several facinating villages below and up the valley. 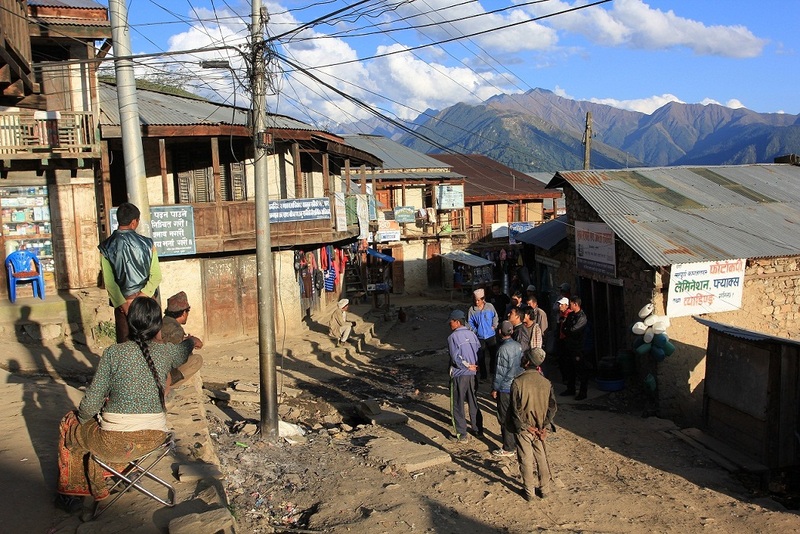 From Simkot “centre” walk up past the Nepal Trust Guest House, the upper school and the Upallo Gaon public tap. Take a left on the main trail and follow this until you get a clear view. Below the first ridge and the current customs police post there is a bhatti serving teas, also herbal teas and chang. Past the army check point at some boulders and past a spring right on the trail there is a small tea house and a big cairn. This is Simkot Lagna. It is only about 150-200 altitude meters from Simkot, but as a newly-arrived at Simkot (2970 m, airport) you will sense the effect of altitude. You can trek to Limi with a trekking company, and it takes a minimum 14 days sound hiking, acommodating for acclimatization. The trek involves following the Kailash trail to the Tibet border, turn east and follow the main valley trail via Til, Hali and Jang. If completing a circle, you continue from Jang via Thangchhe and over the Nyalu La and into the Salli Khola Basin, from where there are three options toward Simkot. Tent camping is the only way to do this trip. There is no other accommodation along this trail – with a few exceptions – or if you have good contacts. There are three (alternatively four) high passes to cross: Nara La 4600 m, Namka La 4300 m and Nyalu La (5000). Nyalu La is snowbound Nov-April, the other passes may also be snowbound. Special permits are needed to trek here, go through a reputable trekking agency or Nepal Trust’s organisation. The Hilsa crossing is tricky because you have to negotiate your way past extortionists of the maoist kind controlling this border, and you have to cross into Tibet. Your trekking guides will try to manage this. To prolong your trip, linger in Limi and explore slopes and side valleys and the Thangchee area and Salli Khola basin. There is a distance shortcut out (or in) via hepka nw of Simkot,but this pass is dangerous due to the quick altitude gain and much up and down (streneous). Better try this on your way back to Simkot. Lonely Planet argues you should just pass Kermi village because there is nothing to see or do. Ha! OK, I will keep those hot springs to myself!!!! Just above the village is a steaming creek and a series of waterfalls and pools. The higher you go, the hotter it gets. Locals separate between women’s and men’s pools, but if nobody is around you can choose according to comfort and temperature. The temperature at the spring itself is scalding. My preference after a couple of visits is the women’s pool at about 40 degrees C. The water is clean and not overtly mineral-rich/sulphuric. At the southeastern edge of the Simkot ledge – literally on the edge of town, there is a small temple dedicated to Shiva. It is not a big or fancy site as such, but a very pleasant goal for an afternoon or early evening stroll. You have a view to the north to the 5-Peak Peak (for lack of a better name), above 6000 meters, and a view down to Humla Karnali river a thousand meters below. On the way to the temple you will pass by the Kalikot stone (see separate tip later). You will get cold and dirty and longing for a hot bath when rummaging around the geography of Humla. There are a few hot springs around, but nothing that beats the arrival back in Simkot and finding the Nepal Trust Guest House and their solar shot water shower. Even if you don’t stay at the giest house you can pay small fee and use the shower. There are several facinating villages located around Simkot. Several worth visiting are just an hour or two outside Sinmkot to the north and northwest toward the village cluster of Bargaon, others are located on the opposite side of the Karnali and past the Simkot Lagna pass upriver. For the latter two options, you will most probably need a guide to secure access and negotiate with potential roving bands of maoists. The housing style in Humla is unique. Most people live in Trans-Himalayan style stone huts plastered with mud. The houses are terraced or multi-story, depending on the slope of the terrain. One family’s roof is the porch of the other, and access is by logs with notches as ladder rungs. Smoke from the hearth goes (theoretically) through the chimney opening, simply a hole in the ceiling. Small rooms, depending on the wealth of the households, are arranged around the entrance corridor and the kitchen room, with only simple furnishings, the bare essentials for cooking and sleeping. The house types differ little from one ethnic group to the other, but generally it is easier to visit peoples of the Tibetan-related communities such as Nyinba, Byansi, Limipa Khampa and other Jads, rather than the Chhetri-Thakuri orthodox Hindu castes who are more reserved and may have inhibitions against welcoming you inside. In Simkot, there are various modern house types springing up, but even so, the essential elements from the original house interiors are replicated in the new houses.